Jeniece Germain is the first Trinidadian post-graduate student receiving a Caribaea Initiative Scholarship. 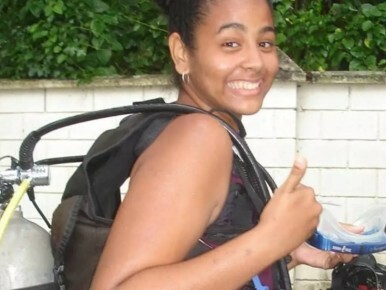 She is currently studying for a Master’s degree at the University of the West Indies (UWI) and is working on the behaviour of gobies in Barbados. We asked her to tell her story and explain why she decided to pursue studies in the field of conservation. How did you choose your area of research? I am from Trinidad and Tobago and only became interested in research my final undergraduate year, when faced with choice of research or another course. Sufficed to say, I was glad I chose the research project. The process from conceptualization to presentation of the information obtained was a teaching and very rewarding experience, which determined study that I currently pursue. I completed my Bsc in Environmental and Natural Resource management, with minors in Marine Biology and Chemistry. 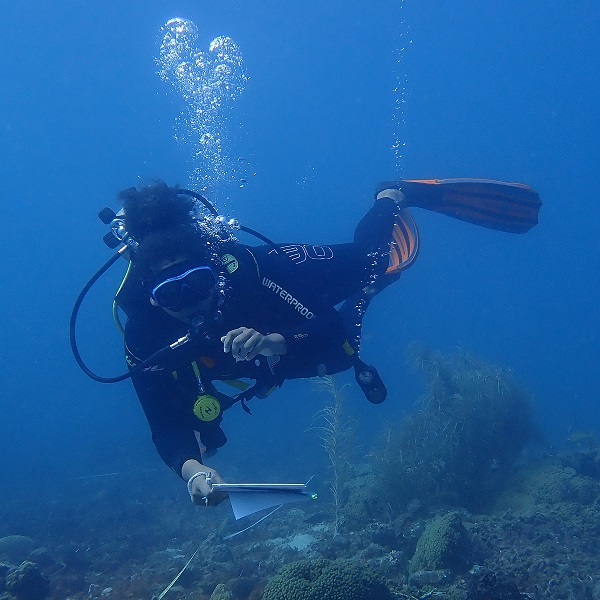 I worked for two years demonstrating (teaching lab sessions) at the UWI St. Augustine, Trinidad and Tobago and I learned to dive. 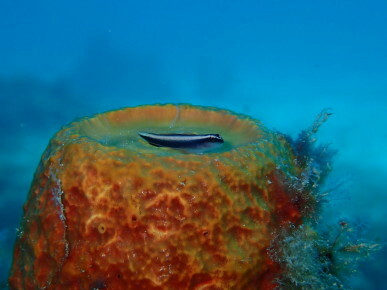 Thanks to the Caribaea Initiative, I am currently doing my Mphil Ecology, at the University of the West Indies, Cavehill, Barbados focusing on habitat use in cleaner gobies in Barbados. 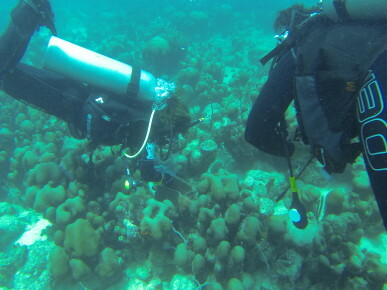 This experience has and continues to expand my interest in research and Ecology, as the study involves monitoring the population dynamics and distribution of two species (Elacatinus evelynae and E. prochilos) in coral and sponge microhabitats. From this population information, we hope to determine what factors drive their habitat use and also how these two species coexist, being so ecologically similar. This experience has given me a renewed appreciation for the work and network of individuals who facilitate and support research, especially in the Caribbean. Thus, I eventually intend continue my studies, to pursue a phD in marine ecology and eventually, be one of the people who can pay-forward what has been afford to me. What inspired you to learn biology and study it? I always had a keen interest coupled with a great fear of the sea. Being a 90’s kid when movies such as “Deep Blue Sea” were popular, one can imagine that that fear was not helped. However, that did not stop me. I got my fair share of ‘the salt’; through National Geographic, Discovery and Animal Planet, television afforded me the opportunity and safety to explore the ocean without being eaten by a lobster (yes, at 5 years old, I was afraid of lobsters). Also, though often wanting to go to the beach, living 2 hours away did not always make that possible. Nevertheless, my inclination toward the environment and love for the ocean did not wane. My father and I would often sit in a tree in our backyard, where he would tell me about the different birds, lizards and insects we observed. He was also into fishing and spearfishing and one of the major influences in why I pursued environmental studies. 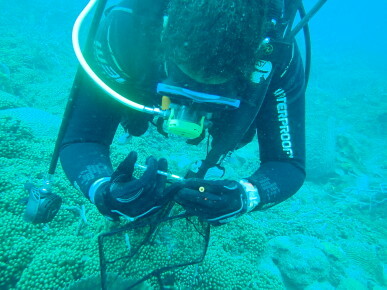 While I may be considered ‘late’ in the field, as I was only able to begin diving after my undergraduate degree, I have learned a lot and have become more acquainted with the work of a researcher and working in the water. The vision of Prof. Cézilly, which is to support the academic development of young Caribbean scientists, so that their research on conservation can contribute meaningfully to the region without heavy dependence on external (overseas) assistance, has also challenged me to broaden my scope. Whereas my goal was once to gain expertise in a taxon, it has now widened to embrace different sub-disciplines of ecology, such as population and behavioural ecology (aspects of my current study). 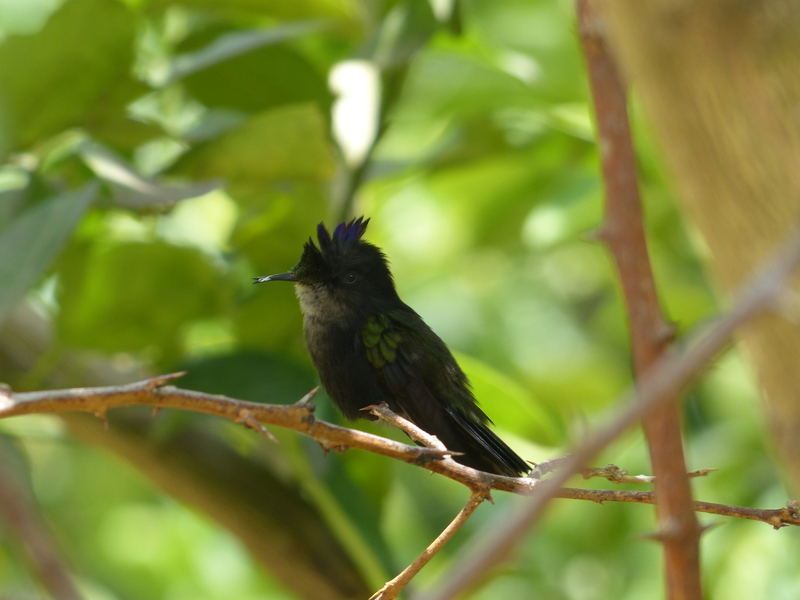 Research & Conservation Workshop in St. Kitts and in Guadeloupe. There, I was able to interact with other biologists and become acquainted with the individuals and their work. 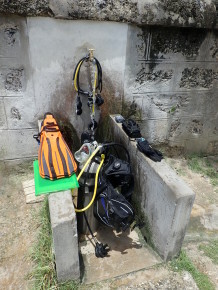 I also had the chance to engage the public in a small presentation to local dive operators and interested parties in Barbados and have been able to improve considerably as a diver. The opportunity of living in another Caribbean country (Barbados), has also been an educational and fun-filled experience. As such, I am truly grateful to the Caribaea Initiative for this opportunity and hope to be of great value to the organisation in the future.